Welcome!! We all love deals, donâ&#x20AC;&#x2122;t we? Especially if it involves products by our favorite brand. So, if you are a vaping enthusiast, you will love the deals by E-juice direct. E-juice direct deals are inevitably going to increase the value for your money and enhance your vaping experience. 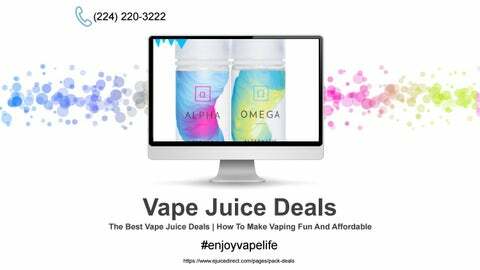 Continue reading to learn more about these fantastic vape juice deals from E-juice Direct and take full advantage of them. Steal of the day deals provides you with tremendous and unbelievable discounts on your favorite brands and flavors. However, here â&#x20AC;&#x2122;s catch these deals will only last for 24 hours, so you have to be quick and order yours before we run out of stock. So, visit us daily to have a look at our daily discount deals. Flaunt your love for your favorite brand and vaping by wearing cool accessories and T-shirts. Wouldn’t it look swaggy if you are smoking Bubble Factory’s E-juice while wearing the cool Bubble Factory T-shirt or having Juice Head’s E-juice while your iPhone cover also says Juice Head? We think that’s swag if you believe that too then get a swag deal for yourself now too! Not only this you will get huge discounts on your favorite brands! Happy vaping.